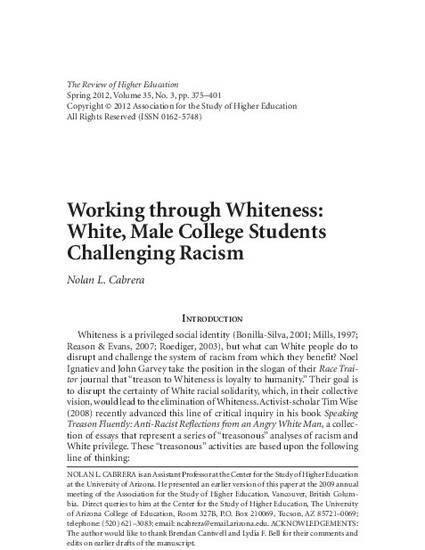 This qualitative study relies upon Freire’s conception of liberatory praxis to examine White male college students becoming aware of racism and translating this awareness into action. The participants developed racial cognizance via both cross-racial contact and course content. Key to this development was empathy derived from minority experiences that facilitated a willingness to understand racial minority experiences. The participants took actions against racism but continued to struggle with race (e.g., essentializing minority experiences). The findings demonstrate the importance of race-based education, empathy, and cross-racial contact in promoting racial identity development, while also illustrating the nonlinear trajectory of racial identity development. Cabrera, N. L. (2012). Working through Whiteness: White male college students challenging racism. The Review of Higher Education, 35(3), 375-401.